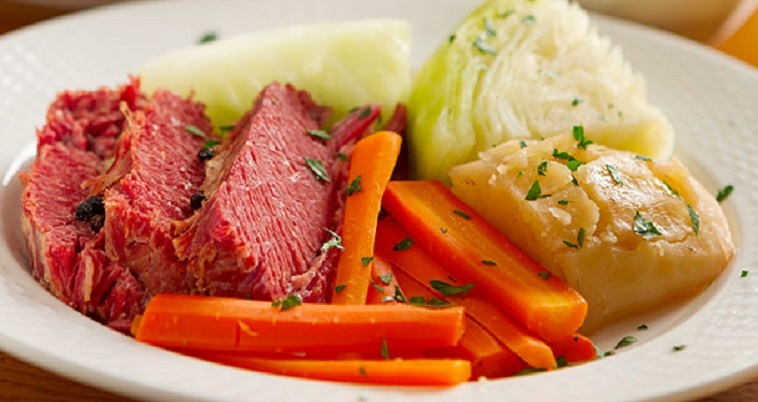 Did you know that corned beef and cabbage is a traditional American dinner on St. Patrick’s Day and not an Irish one? Beef was not readily available in Ireland and was considered a luxury. Irish folks actually celebrate St. Patrick’s Day with bacon, pork or lamb and a plate full of vegetables. The term “Corned” comes from putting meat in a large crock and covering it with large kernels of salt that were referred to as “corns of salt”. This preserved the meat. So how did pork and potatoes become corned beef and cabbage? The tradition started in the 1900s, when the Irish emigrated with other ethnic groups to the United States. Irish immigrants in America lived alongside other European ethnic groups. Members of the Irish working class in New York City frequented delis and lunch carts and it was there that they first tasted corned beef. Cured and cooked much like Irish bacon, it was seen as a tasty and cheaper alternative to pork. And while potatoes were certainly available in the United States, cabbage offered a more cost-effective alternative to cash-strapped Irish families. Cooked in the same pot, the spiced, salty beef flavored the plain cabbage, creating a simple, hearty dish that couldn’t be easier to prepare. The popularity of corned beef compared to bacon among the immigrant Irish may have been due to the fact that brisket was cheaper and more readily available in America. Once in America, they took to cooking beef brisket, an inexpensive cut prized by their Jewish neighbors on Manhattan’s Lower East Side. After taking off among New York City’s Irish community, corned beef and cabbage found fans across the country. It was the perfect dish for everyone from harried housewives to busy cooks on trains and in cafeterias—cheap, easy to cook and hard to overcook. It was even served along with mock turtle soup at President Lincoln’s inauguration dinner in 1862. 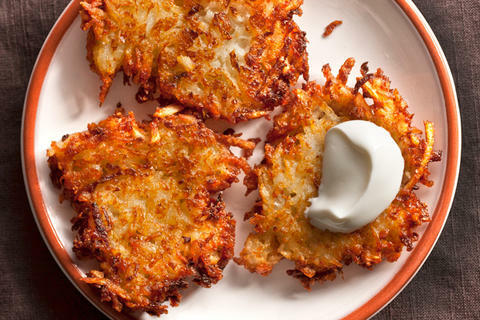 Looking for some different side dishes for your St. Patrick’s Day dinner? The traditional dishes often include shepherd’s pie, corned beef and cabbage and Irish soda bread. For those who keep to the Irish-American tradition, the bad news is this: the meal is not exactly healthy. Corned beef contains about 285 calories for a four-ounce portion and is packed with a whopping 1,286 milligrams of sodium per serving. That’s more than half of the sodium you’re supposed to have all day. Pair the meat with potatoes, bread and an Irish beer and you have a caloric bomb on your hands. I don’t want to ruin your feast, but if you really want corned beef and cabbage for St. Patty’s Day, there are ways to make the meal healthier. At the butcher, ask for an extra-lean cut of corned beef. Cut off all visible fat and steam-cook or bake the meat in the oven to melt away much of the additional fat. Here is a link for a recipe on how to bake corned beef instead of braising it. Instead of cooking the traditional vegetables along with the corned beef in the fatty highly salted water try these healthier side dishes to celebrate the holiday. Serve this delicious soup as a first course. Bring the broth, black pepper, garlic, broccoli, potatoes and onion in a 6-quart soup pot over high heat to a boil. Reduce the heat to low. Cover and cook for 15 minutes or until the vegetables are tender. Remove the soup pot from the heat. Process soup ingredients with a hand-held immersion blender or puree in a food processor. Return all of the puréed mixture to the soup pot, if using a regular processor. Stir in the milk, salt to taste and cheese. Cook over medium heat until mixture is hot. Preheat oven to 350 degrees F. Line fifteen 2 1/2-inch muffin cups with paper baking cups. Coat the paper cups with a little cooking spray; set pans aside. In a medium bowl stir together cornmeal, flour, baking powder and salt. Make a well in the center of the flour mixture. In a small bowl combine eggs, milk, yogurt, honey and oil. Add egg mixture all at once to the cornmeal mixture. Stir just until moistened. Spoon batter into the prepared muffin cups, filling each two-thirds full. 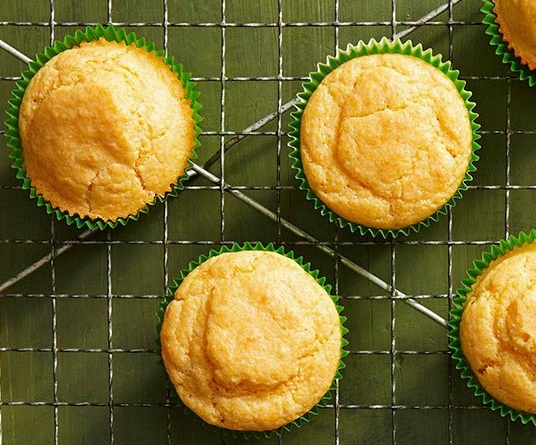 Bake for 20 to 25 minutes or until a wooden toothpick inserted in the center of the muffins comes out clean. Cool muffin pans on wire racks for 5 minutes. Remove muffins from the pan and serve warm. 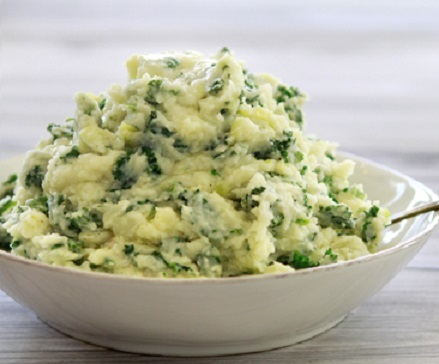 Colcannon is a traditional Irish dish made from mashed potatoes and cabbage. In a soup pot, add potatoes, parsnips and bay leaves. Cover with water and bring to a boil. Lower the heat to a low boil or simmer and cook for 20 – 30 minutes or until the potatoes and parsnips are tender enough to be mashed. Once the potatoes and parsnips are tender, drain the water and discard the bay leaves. Mash the potatoes and parsnips in a large mixing bowl. Set aside. Melt 1 tablespoon of butter in the soup pot used to boil the potatoes. Saute the leek over medium heat until tender, about 3 – 5 minutes. Add the kale and saute for 2 – 4 minutes or until tender. Stir in the milk, salt and pepper. Cook over medium until heated. Pour over the mashed potato mixture in the mixing bowl and stir until combined. Taste for seasonings and add additional salt and pepper if desired. Heat olive oil in a large non-stick skillet. Cook garlic on medium-high heat for about 30 seconds, remove from skillet and set aside. Add beans to the same skillet and sauté for about 6 minutes or until beans are cooked but still crispy. Return garlic to the skillet and cook an additional 30 seconds. 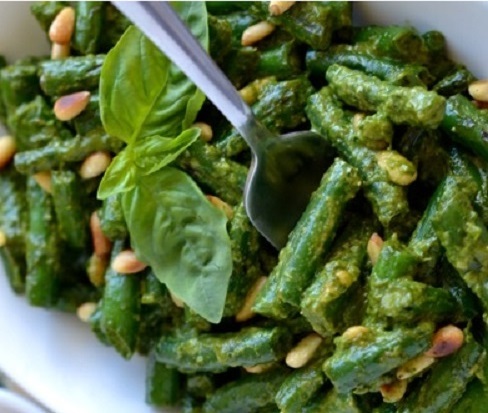 Pour into a serving bowl and toss with the pesto. Sprinkle with pine nuts and serve. Process the basil, garlic, nuts, salt and pepper into a paste in a food processor. Add the olive oil slowly through the feed tube to produce a loose-textured puree. Mix in the cheese. Finely shred potatoes and apples on a grater; pat dry on paper towels. Place in a bowl; add the eggs, onion, flour and salt. Mix well. In a large skillet, heat 2 tablespoons oil over medium-high heat. Drop batter by heaping tablespoonfuls into the hot pan. Flatten to form 3-inch pancakes. Cook until golden brown; turn and cook the other side. Drain on paper towels. Serve immediately with the sour cream, if desired. In a large ovenproof skillet, cook the pancetta over medium heat until browned. Remove to paper towels with a slotted spoon. Add Brussels sprouts to the skillet; cook and stir until lightly browned. Remove from the heat. Stir in the capers, oil, vinegar, lemon juice, salt and pepper. Bake, uncovered, at 350° F for 15-20 minutes or until caramelized, stirring occasionally. Add the raisins, pine nuts, lemon peel and pancetta; toss to coat. Adore Colcannon. Your Sicilian Brussel sprouts look delicious too. Thank you but you may want to sub cabbage for the kale in my colcannon recipe, then. 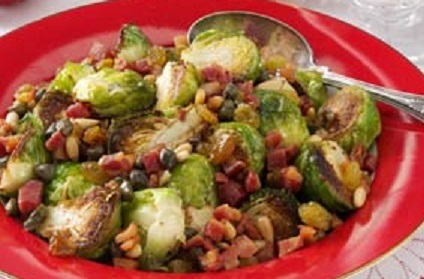 All those additions give the brussels sprouts lots of flavor. No, fancy trying kale with it as it is so healthy. I have been mixing mashed potatoes and kale for several years. My kids liked it better that way. Ok, I’m making your Colcannon with Leeks and Kale recipe today to go with the corned beef. How yummy! In fact, that might be one that sticks around for other days as well since we love potatoes, parsnips and kale mixed. Thanks for sharing such wonderful recipes. Thank you Heidi. I hope you like the colcannon. I love the history lesson and that broccoli soup! Thank you Jilian. I include a lot of food history with my recipe posts. I am glad you like it. Happy St. Patrick’s Day, Jovina! 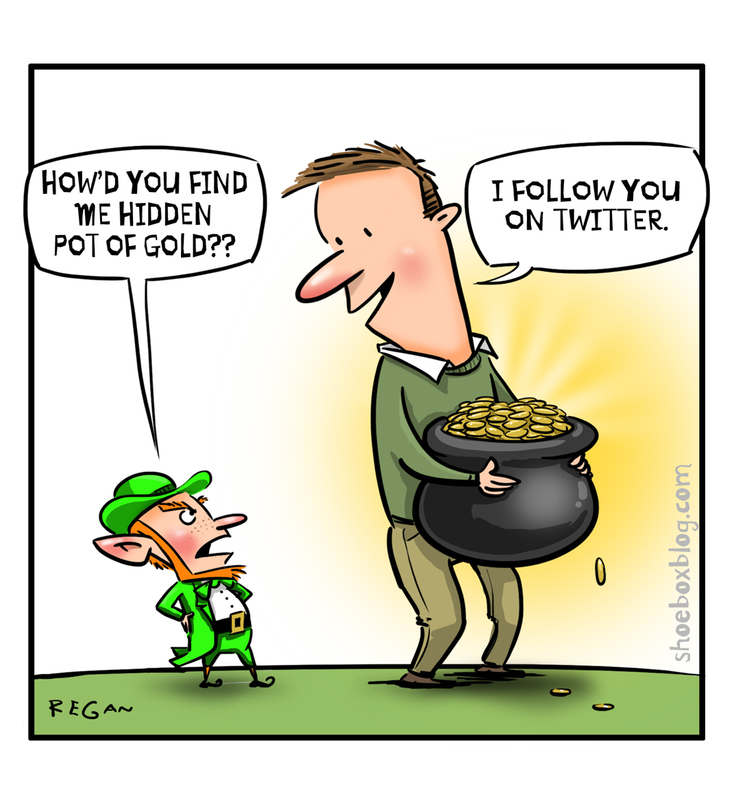 And a Happy St. Patrick’s Day to you and your family. I really like the Sicilian Brussels Sprouts. Thanks.